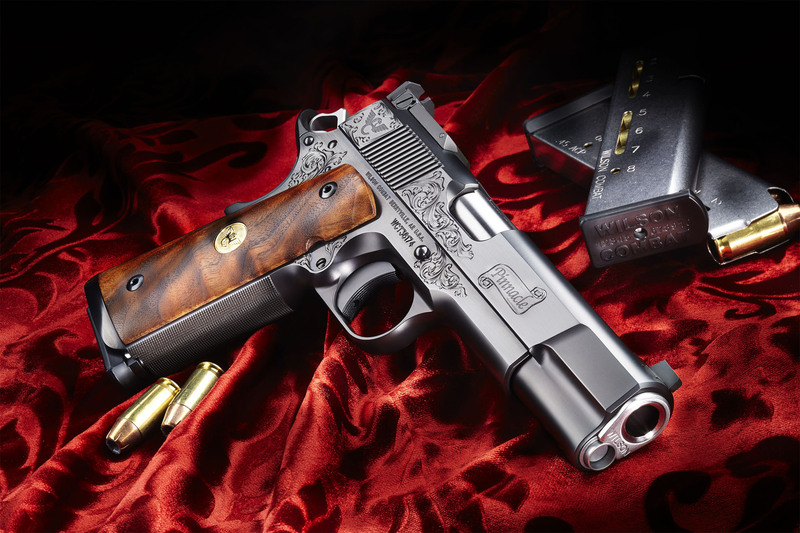 The Pinnacle is expertly hand fitted and finished by a Wilson Combat Supergrade Pistolsmith prior to an application of spectacular hand engraving in a traditional classic scroll pattern. After hand engraving, a Master Pistolsmith will then further hand detail and finally apply our rich, deluxe blue finish. From the blued-steel trigger and spiral-fluted guide rod to the custom burl walnut grips you will see several minor and unique differences from a typical Supergrade. The immaculate hand engraving of the Pinnacle is expertly applied over the complete pistol by renowned firearm engraver Wayne D’Angelo. D’Angelo is one of the world’s foremost engraving artists and his attention to detail is legendary. He is the former chief engraver for Smith and Wesson and contract engraver for Colt and we are proud to work with him on this project. The Pinnacle is truly our Pinnacle of craftsmanship and in the world of bespoke, custom pistols it truly stands alone. This eye-stopping, heirloom-grade pistol will be very limited in production. The Pinnacle represents our “Best of the Best” custom 1911 handgun. *Available for purchase directly from Wilson Combat only. No dealer sales.